Reforming of metal materials at a temperature range below recrystallization temperature, i.e. reforming of a material in cold conditions. Reforming above this temperature range is referred to as hot forming. The cause for solidification of metals due to cold forming is an increase in dislocation density (see Cold solidification, Solidification mechanisms). From approx. 107 dislocations per cm2 the density can be increased to values of around 1012 per cm2. The decisive mechanism for multiplication of dislocations is the Frank-Read mechanism (Fig. 1). A straight dislocation moving through the matrix is fixed by its ends in two sites (a). If this dislocation continues to move due to shear force being exerted perpendicularly to the straight line, the line bends to a curve and subsequently to an arc that forms between the two fixing points (b); if the force continues to be applied, the arc deforms into a semicircular loop (c). Annihilation (i.e. mutual elimination) of parallel dislocation line segments with different mathematical signs eventually results in increase of the loop and finally detachment of a new dislocation ring (d). Under renewed or continued sear stress this process constantly repeats so that the source constantly generates new dislocation rings (e). 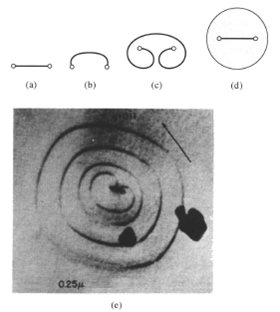 These dislocation rings encounter other obstacles or rings from other sources in the matrix and react with them. In this way, entire dislocation networks are eventually established.